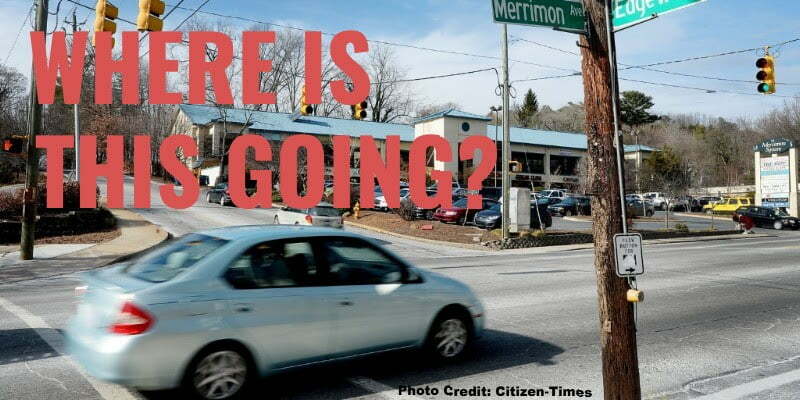 The recent Merrimon Avenue widening project is a big deal and your attention and action is needed. Now. Asheville on Bikes opposes construction of this project as it has been proposed. You can advance safe cycling and complete streets in Asheville by providing public comment to the North Carolina Department of Transportation (NCDOT) regarding the “Merrimon Ave Intersection Improvements at Edgewood through WT Weaver Boulevard.” A map of the proposed changes can be viewed here. If you email, please cc Asheville on Bikes at ashevilleonbikes@gmail.com as we’d like to have a copy of your comment on file. Business closures. Construction is likely to cause several local businesses in this stretch to close permanently. They can expect months of reduced revenue during construction. Another Hendersonville Road clone. The finished roadway will look almost exactly like Hendersonville Road. Compare them on Google maps. Faster cars. Car speeds are going to dramatically increase because the design speed chosen will allow a driver to feel safe at speeds higher than 40 mph. During the public meeting NCDOT confirmed that a 40 mph design speed was used. City ignored. The City has spent money and made a decade of planning changes (Rezoning, etc.) on Merrimon that contradict the nature of this design. These plans, based on countless hours of feedback from residents, have been ignored. NCDOT funded, sat on the steering committee, and ultimately reviewed and endorsed the City of Asheville Comprehensive Bicycle Plan. The needs identified for Merrimon in that plan are ignored. Alternates not presented. NCDOT has not presented alternate designs. For the design as a whole, alternates include a roadway with a lower design speed and narrower lanes. Alternates not presented also include a low impact road connection for Clearview Terrace that takes no homes. Greenway improvement ignored. NCDOT is not proposing that the Glenn’s Creek Greenway connect, even though they are replacing the culvert and rebuilding the creek through the intersection of WT Weaver. They are putting back a version of the current (unsafe) Greenway connection. During construction, the historic property that UNCA owns on the corner of WT Weaver will be altered forever, via tree removal, grade changes, and structural changes along the creek. Neighborhood needs ignored. This plan restricts a Norwood Park resident’s ability to travel between Merrimon businesses and their home. It prioritizes through traffic over local traffic, for all nearby neighborhoods, when the latter is what neighborhood residents want to improve. Risk of pedestrian injury increased. A 5-lane road with a 40 mph design speed is more difficult to cross than the current road. Our current Merrimon recently took the life of one pedestrian, crossing at Coleman. NCDOT and Federal design standards not followed. NCDOT is ignoring the AASHTO Guidelines for the Development of Bicycle Facilities, which is adopted via NCDOT’s own Bicycle Policy as the accepted guidance. NCDOT’s Bicycle Policy states: “All bicycle transportation facilities approved by the Board of Transportation shall conform with the adopted “Design Guidelines for Bicycle Facilities” on state-funded projects, and also with guidelines published by the American Association of State Highway and Transportation Officials (AASHTO) on federal aid projects.” The most recent version was completed in 2012. Note that the guide states that shared lanes less than 14 ft may still be designated as shared lanes, but the conditions stated above related to Merrimon seem to indicate it is unacceptable on a road with these features, versus a lower volume, lower speed, flatter road of similar configuration. Faster travel times for cars who are attempting to drive through this area to reach Beaver Lake. These cars will have with travel times improved by some small margin. Is it worth it? And could we have this benefit from some other design? NCDOT staff confirmed at the public meeting that they evaluated Level of Service for cars but did no such analysis for pedestrians or bicyclists. NCDOT utilizes the federally-accepted Highway Capacity Manual to conduct vehicular level of service analysis. The Manual also contains modules for bicyclist and pedestrian level of service. NCDOT gathered car data that is also used in their software modules for calculating bicycle and pedestrian level of service, but by failing to gather additional information and complete a bicycle and pedestrian level of service calculation, even though their software includes options to make these calculations, they are blind to the potential effects of their design on these important road users. YOU are what stands between this proposal being built and something else, something better, for our city. Craft an original letter. NCDOT does not accept form letters as public comment [Edit: they might, but a unique comment is still best], so be sure to tailor your letter and consider including some of the points below. It is okay to ask them to do nothing, if you think that no change is a better outcome than the proposed change. Submit your letter or email by January 29th. Merrimon Ave is recognized in the Bicycle Framework Plan as a route “that serve(s) as a support system for primary routes” and the inclusion of bike lanes is recommended (Asheville in Motion Plan, p.76). The need for a bicycle and pedestrian network is identified in 2025 plan’s Transportation Vision. 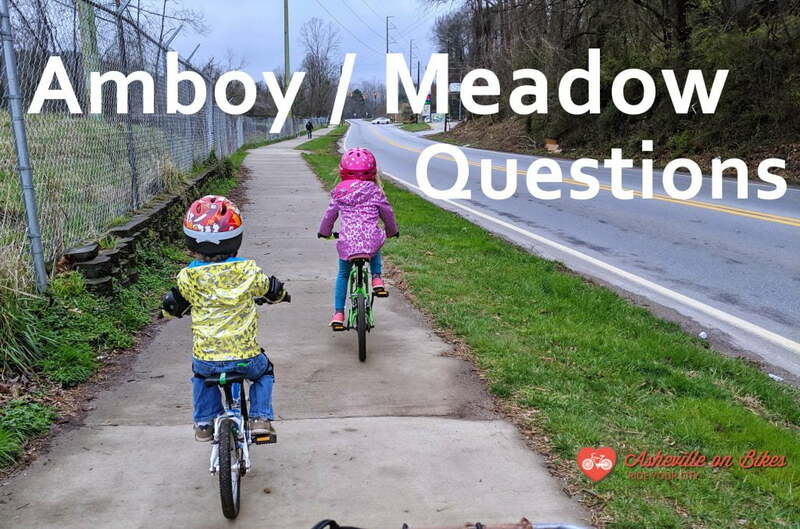 It states, “Vision: The City of Asheville will have a network of bicycle and pedestrian routes which are safe and provide reasonable transportation choice for its residents as outlined in the Asheville Greenway Master Plan and the City’s Bicycle and Pedestrian Plan. The 2025 also states, “The City of Asheville is experiencing rapid growth in population that has burdened the existing transportation network and created an unfriendly environment for walking and bicycling. Long-range land use planning presents opportunities to rethink how communities develop to meet the needs of mobility, access, activity and choice (Asheville City 2025 Plan, p.40-41). NCDOT’s Community Characteristics Report, US 25 (Merrimon Ave) King Street to Maney Avenue: Operational Improvements City of Asheville, Buncombe County (CCR), originally developed in 2009. The report also states, “The intersection crossing treatments at US 25 and W.T. Weaver Boulevard will require special design considerations to accommodate the at-grade crossing of the greenway trail. The City of Asheville noted their desire for crosswalks along all four legs. To properly accommodate multi-use pathway traffic and meet Americans with Disabilities Act requirements, the crossing treatment on at least two connecting legs of the intersection will require wider sidewalk widths, curb ramps to accommodate pedestrian and bicycle traffic, and pedestrian/bicycle activated buttons that are not typically part of NCDOT’s standard drawings for these facilities. Encourage NCDOT Division 13 to follow existing NCDOT Transportation Policy regarding active transportation. Working in partnership with local government agencies, interest groups, and the public to plan, fund, design, construct, and manage complete street networks that sustain mobility while accommodating walking, biking, and transit opportunities safely (North Carolina Complete Streets Planning and Design Guidle, p.3). According to NCDOT’s Complete Street website, Division 13 has yet to complete a Complete Street project [Edit: NCDOT partnered with the City of Asheville to build a sidewalk and pedestrian improvements on North Louisiana Ave in West Asheville; though a sidewalk is part of a Complete Street, the North Louisiana Ave project was pushed by the community and City of Asheville; It required NCDOT participation because North Louisiana Ave is controlled by NCDOT). Cooperation and Coordination – A commitment is made to encourage cooperation and collaboration among relevant government agencies and community stakeholders to establish a framework for multiple stakeholders to set shared goals and focus on coordination and accountability (Components of a Strong Vision Zero Commitment). The proposed 2ft shared bicycle lane on a road with a 40mph design speed does not conform to AASHTO standards. AASHTO’s Bicycle Facilities Guide (4th Edition) states, “The minimum operating width of 4 ft (1.2 m), sufficient to accommodate forward movement by most bicyclists, is greater than the physical width momentarily occupied by a rider because of natural side-to-side movement that varies with speed, wind, and bicyclist proficiency. Additional operating width may be needed in some situations, such as on steep grades, and the figure does not include shy distances from parallel objects such as railings, tunnel walls, curbs, or parked cars. In some situations where speed differentials between bicyclists and other road users are relatively small, bicyclists may accept smaller shy distances. However this should not be used to justify designs that are narrower than recommended minimums. The operating height of 8.3 ft (2.5 m) can accommodate an adult bicyclist standing upright on the pedals (AASHTO Bicycle Facilities Guide, 4th Edition, Section 3-2). Read what your neighbors wrote to NCDOT; full text of 95 NCDOT Merrimon comments. Read Asheville on Bikes’ official comment submitted to NCDOT for this project.